P299196LF is rated 3.5 out of 5 by 2. 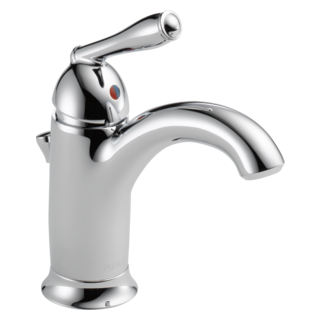 Rated 2 out of 5 by AngryPlumber from Looks good, cheap parts I bought two for a double sink. The first install was okay, the second horrible. After doing the plumbing from the wall and getting things lines up I started the second install. The sink drain nut broke while hand tightening it. That equals leak. I searched all over and nothing fit (all slightly smaller). I then contacted peerless (delta) and they were kind enough to to send a replacement drain assembly. I was thinking I could just use the but and be on my way....no. had to cut out old drain and start from square one. Time is money, and this cost me too much time. Never again. 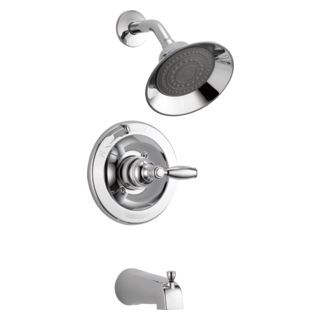 Rated 5 out of 5 by Ping from Good product and very affordable We ordered this product for our bathroom remodel. Our plumber had no trouble to install them. He did not read the instructions at all and finished it in 10 minutes for installing one of them. They look great and matches my other moen products. Saved me more than $200 as I did not order the matching moen faucets. Works perfect. 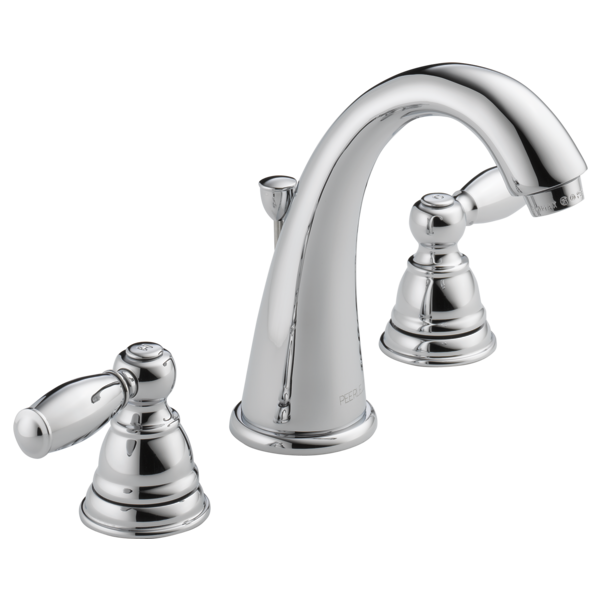 I purchased 2 Peerless Clayborne bathroom faucets for my double vanity sink. The horizontal pivot rod is about 3&quot; too short to meet the clevis. How do I solve this issue without spending a lot of time or money. Disappointed. 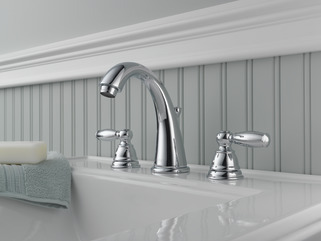 How do I get the caps off the hot/cold bathroom faucet? (The handles are getting loose). Same Question Cory had. Which part is bonnet nut to unscrew? 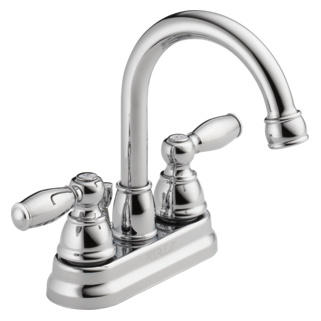 I do not see any screw under the cap or side hole to use allen ranch to pull the top up. Mine is exactly same Model y the picture but about 10 yr old one installed when my house built. I have a two tap bathroom faucet that is dripping from the spout. I have identified the hot tap as the problem. I can remove the handle and nut, but cannot lift out the stem. 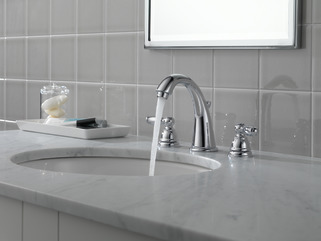 What is the color of this faucet? In the picture, the color seems to be more black than bronze. I am considering a purchase but the color is the determining factor. Can this pop up be used on a sink without overflow? 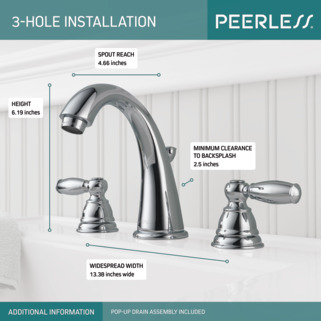 In installed the pop-up assembly with silicone under the flange, but it seems that my sink drain has a deep slope and the sides of the flange do not lie flat against any part of the hole at the bottom of the sink. It leaks all around the sink drain. What can I do? ?